Ed Belfour became the starting goalie for the Blackhawks in the 1990-91 Season, and turned in what many consider to be one of the best rookie seasons in NHL history. He notched 43 victories in 74 games (both NHL rookie and Blackhawk team records), finished the season with a 2.47 GAA and 4 shutouts. For his success, he received the Calder Memorial Trophy for outstanding play by a rookie, the Vezina Trophy for best goaltender and the William M. Jennings Trophy for fewest team goals-against. He would win the Vezina Trophy again in 1993 and the Jennings Trophy in 1993, 1995, and 1999. Belfour was inducted into the Hockey Hall of Fame in the 2011 class, his first year of eligibility. 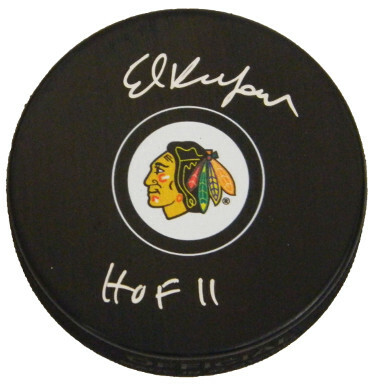 Ed Belfour has hand signed this Chicago Blackhawks Hockey Puck with HOF 11 inscription. Schwartz Hologram and Certificate of Authenticity from Athlon Sports Collectibles.